.AMAZING MATERIAL NOT ONLY HELPS SADDLE FIT, BUT PROTECTS AND PROVIDES COMFORT! When you see Ultra ThinLine sewn onto any saddle pad, there is a pocket for you to add inserts. Inserts are made in three thicknesses of amazing shock absorbing protection: ThinLinePlus+ 1/4″, Ultra ThinLine (thinner) 3/16″, and ThinLinePlus+ Booster shim. Inserts have been carefully designed by Master Saddlers. They are custom cut with a tapered edge to ensure you will never have a pressure point. Our exclusive foam makes saddles fit better and horses more comfortable. Adjust saddle fit and add more protection for your horse all in one easy step. Colors: ThinLinePlus+ shims are available in black only. 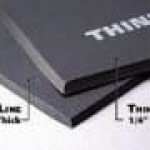 Ultra ThinLine shims may arrive in black, brown or white. Shims cannot be seen inside your pad, so color is not an issue. If you have a set of shims with texture on top it is Ultra ThinLine. Please note: Bridging Shims for Swayback – If your saddle is bridging, you are missing contact in the middle of the horse’s back and there is too much contact at both the wither and the cantle. When using bridging shims, we recommend you start slowly. Use only one or two at a time. You will discover your horse will begin to lift their top line and develop more muscle with ThinLine. Once the muscle is developed it is often possible to remove one or all of the shims. Good news: you keep your ThinLine pad and horses continue to use their backs correctly.